I was given this Sheevaplug. The idea with plug computers is they look like just a wall wart, but are a whole computer. 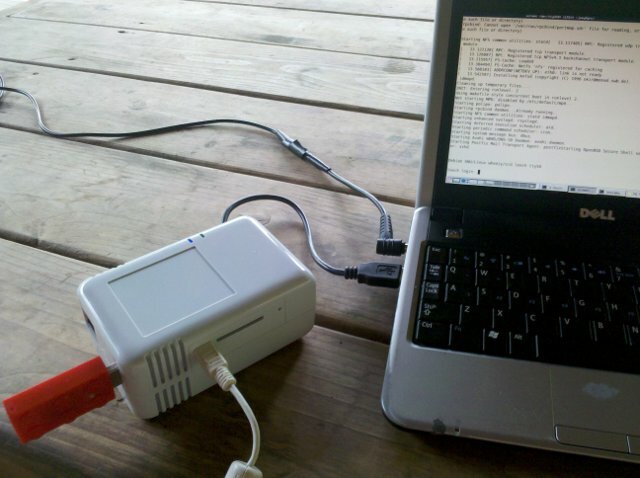 Ideally, a FreedomBox. The wall wart computer concept doesn't entirely work for me because first, I don't like socket blocking wall warts, and secondly, I'm living in the island of Offgridistan with its weird 12 volt wall sockets. Solution was to convert it to be USB powered. This is easy because the Sheevaplug's built-in power supply runs it at 5 volts. my Sheevaplug, powered by my laptop, with serial console also hooked up to show boot. 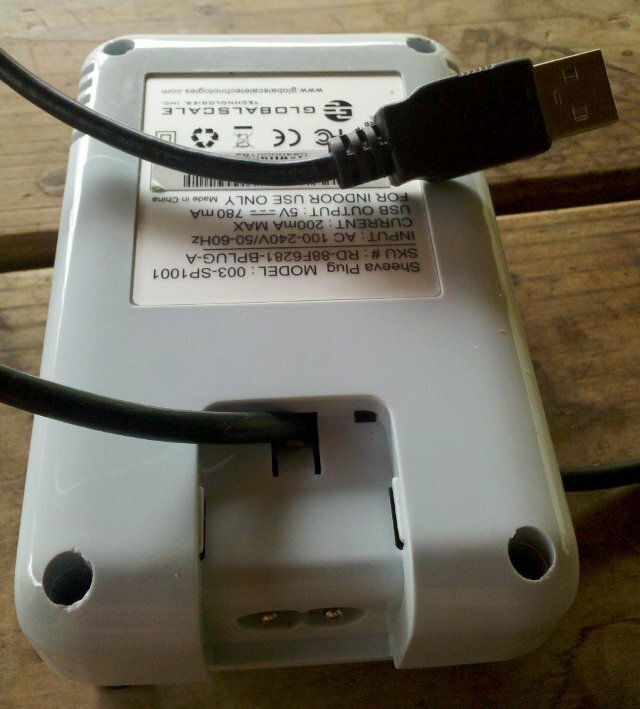 The USB power cable was conveniently routed in through a clip that holds the power socket in place. Bonus: The clip lets the cable be pushed in, but not pulled out, which avoids strain on the connection. I'd probably not want to fly with the result (want to install a proper USB socket for power to avoid the dangling exposed wire effect), but it's otherwise pretty perfect. I've replaced my nslu2 wifi/dialup/cache/mpd box with the Sheevaplug, and the massively increased memory and speed, at nearly the same power, is a nice improvement. I did run into two weird issues. I have to use a USB stick for storage, since both SDHC cards I tried, a 16 gb Transcend and a 1 gb no-name had lots of IO errors (error -110). I don't seem to be the first to encounter that, but there is not a sure workaround, although recompiling the kernel wirth high speed SD disabled might fix it. Also, u-boot refused to boot from my USB stick when I used one USB hub; with a different hub it worked ok.